Over the past year, requests for local and regional grapes, as well as many native and hybrid varieties, have been frequent. Regional grape shortages appear to be on the rise in many states, especially as the number of wineries without estate vineyards continues to grow. Coupled with seasonal variability – late season frosts, humid or wet growing seasons, and winter injury – it can be a challenge for many wineries to find and secure regional grapes or juice to make into wine. 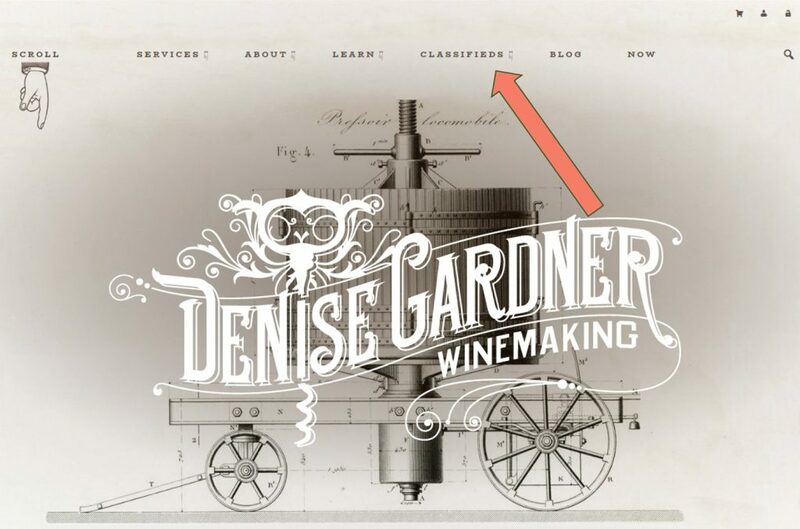 Part of Denise Gardner Winemaking’s mission is to improve production efficiency. As the number of procurement requests are increasing, I’m pleased to announce the opening of DG Winemaking Classifieds available to all in the winemaking industry. Where can I find the DG Winemaking Classifieds page? 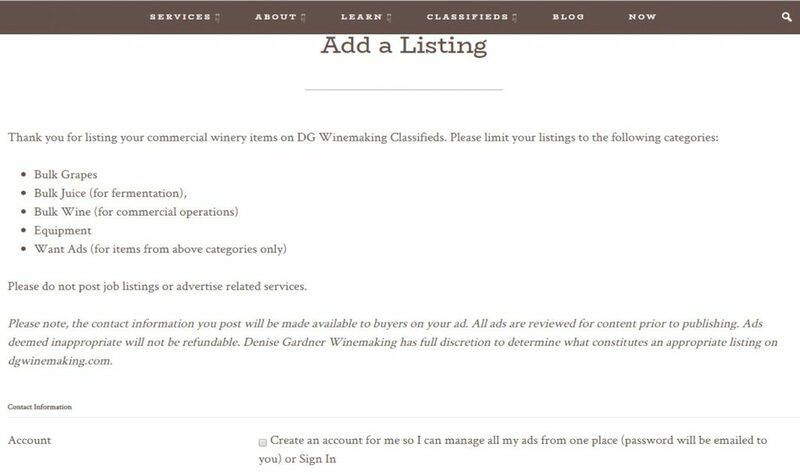 Anyone can access classifieds through DG Winemaking by clicking on the “Classifieds” tab on the homepage. The DG Winemaking Classifieds home page allows any visitor to scan through current posted ads at no cost to them. Ads are available for viewing for 90 days. Want ads (Searching for…) for when you are looking for something for your winery (such as available grapes). Ads are available for viewing by anyone that visits the website. Each ad will be available for 90 days after it is posted. Each viewer is responsible for contacting the individual/company that posted the ad to discuss a potential sale. 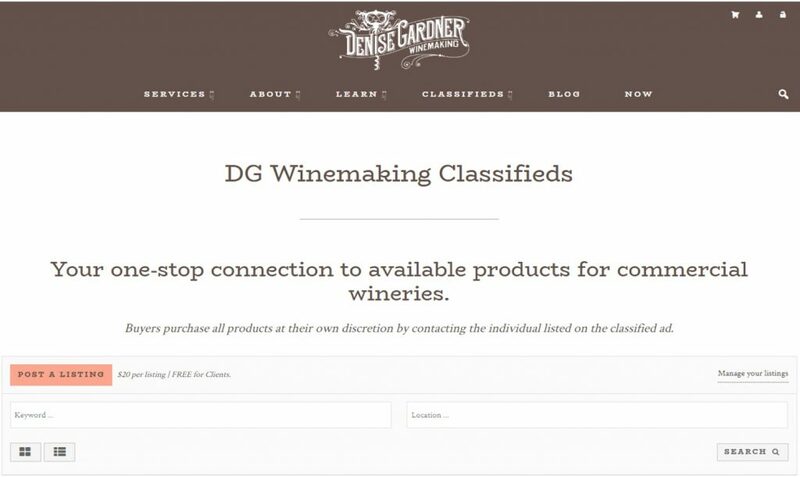 DG Winemaking is not involved the sale of anything posted on the Classifieds pages. How can I post an ad on DG Winemaking Classifieds? Viewers can post an ad by clicking on the “Add a Listing” from both the Classifieds drop down menu and the “Post a Listing” salmon-pink button on the Classifieds page. DG Winemaking clients that have purchased a consulting package and Darn Good Winemakers members can login to post and manage their ads. Any visitor can make a listing following the easy-to-use posting format. DG Winemaking offers ads for commercial bulk grapes, juice, and wine as well as equipment and want ads for those things needed by a commercial winery. Additional information is allowed and information, such as photos, is encouraged for items like equipment. What is the cost to post a classified ad on DGWinemaking.com? DG Winemaking clients can log into the website and post an ad for no additional fee at any time. Non-DG Winemaking clients and Darn Good Winemakers will have to purchase ad space for $20/ad, which will remain posted for 90 days unless the item is sold and the poster deletes the post. To renew the ad after 90 days, an additional $15 fee is requested. When can I use the Classifieds? I’ll do my best to circulate classifieds through my bi-monthly e-blasts and increase exposure for you amongst those that follow DG Winemaking. I’ll regularly update classifieds through the DG Winemaking Facebook page. I highly encourage you to share our classifieds pages with your regional organizations and fellow industry members in an effort to better distribute availability of regional product. Of course, it goes without saying that if you have suggestions on how to improve this portion of DG Winemaking, please do not hesitate to reach out to me at info@dgwinemaking.com.